Anything that taste sweet & sour will sure boost my appetite. I love sweet & sour food so much. 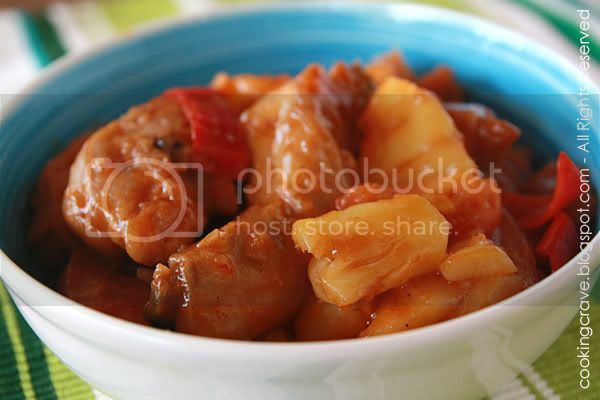 Yesterday, I cook my family's favourite Pineapple Chicken -“菠萝鸡”. We can't finish one pineapple as my kids they don't eat pineapple and end up cooking this dish for lunch. This dish is super yummy!! It's very easy to cook and taste heavenly...trust me!!! "Claire, you must try this ya :p ~"
Season with marinade ingredients for at least 30 mins (I marinade it overnight because I was in the rush of time). Deep-fry it in the hot oil until golden in colour. Remove from oil, drain well and set a side. Heat 1 tbsp of oil in the hot wok, add in the chopped garlic, onion wedges and stir-fry till it's fragrant. Add in sauce mixture and bring to boil. 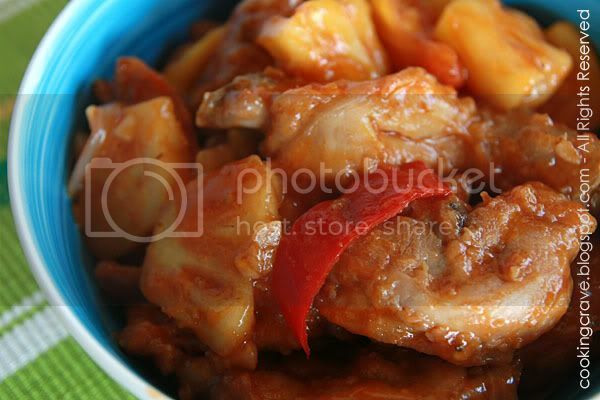 Add in fried chicken pieces, pineapple, red chillies and tomatoes. Stir-fry briskly until well combined. Thicken with the sauce with some constarch solutions (*optional - just omit this step if the sauce already thick). p/s: Before dish up taste and slightly adjust the taste to your own liking. Add more sugar if you prefer it to be sweeter, more tomato sauce if you like it sourish or some salt if you like it salty. I have some pineapple in the fridge and just wondering what to do with it. Thanks for the recipe! 酸酸甜甜 , very appetizing ! The photo says it all... delicious! This is just like the sweet sour pork version too! I love it with hot steamed rice! Hi Amy, wow! Are you a Nyonya lady? I glanced at your other foods you cooked, the ikan kembong sure a Nyonya dish. Love this sweet sour dish. Looks sinfully delicious. It is a wonderful, beautiful, and a privilege to have not only a talented woman who can cook but her beauty as a bonus. You have a great weekend, and keep a song in your heart, best regards, Lee. I love anything sweet and sour..
Wow - this looks absolutely delicious! Hi Tintin, you've such a fabulous blog. And all the pictures look absolutely stunning & delicious. haha.... Don't worry! I won't eat the photos. Cheers. tin tin..getting ready to Hanoi?? Wow! 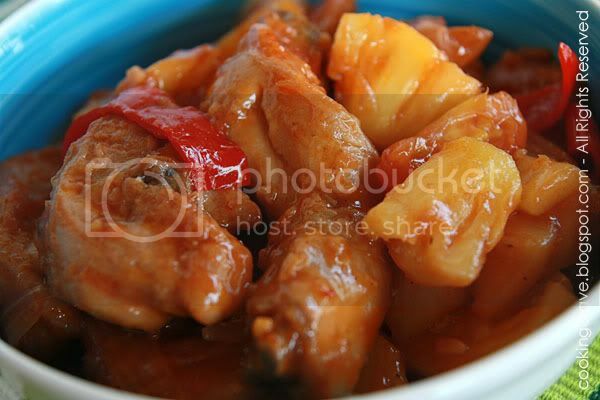 I love sweet and sour pineapple chicken! Yummy! wow, l like this very much. so appetizing. The photo can tells it all.Looks super delicous and appetizing. Browse through your blog and love your food and clear instructions. This looks delicious! Great pictures, beautiful colors! Now this looks deliciously nice.